Glasgow assistant coach Mike Blair believes the club are entering a season-defining phase – starting with the visit of Cardiff Blues to Scotstoun in the Guinness Pro12 on Saturday evening. In the past month the Warriors have turned a three-game losing slump into a four-game winning run which has got them well and truly back in the mix on two fronts. Hogmanay’s bonus-point triumph in Treviso took Gregor Townsend’s men back to the brink of the top four on the back of a derby success at Edinburgh and a thrilling Euro double over Racing 92. 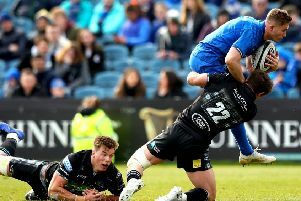 Glasgow are now looking to rack updefine another Pro12 win before heading back to Champions Cup business at home to Munster and away to Leicester as they seek that first-ever quarter-final berth. “It’s a big three weeks for us and in a way they define our season,” said Blair as he looked ahead to Saturday’s sold-out encounter with the Welsh outfit. “We certainly don’t want to drop off the top four in the Pro12. It’s a tough run of games for us but the crowd at home have really lifted us. “The Racing game at home a couple of weeks ago was an incredible atmosphere and there are a few of us who hadn’t experienced anything like that at a club game before. Cardiff ended last season strongly and had been tipped to banish their years of under-performing this season but they are down in seventh, despite a 23-19 win over the Warriors at the Arms Park last September. The Blues play on a similar 3G surface to the one now installed at Scotstoun so there won’t be any advantage to exploit on that score. “The surface is what they’re used to and they’re playing a good brand of rugby as well, we were on the end of a loss down there earlier in the season and they defended really well against us,” said the former Scotland scrum-half. “They’ve had three opensides playing in their back row which is a real threat to us. is one man who still has to sort out his future by May, when Townsend departs to take the Scotland job and takes defence coach Matt Taylor and pack chief Dan McFarland, while Kiwi Dave Rennie arrives at Scotstoun. “As an Edinburgh guy I was slightly apprehensive coming to Glasgow but, right from the start, I have been made really welcome, first as a player and now as a coach,” said Blair. “I am loving my time here and will find out what is going on in the next couple of months. “I am led to believe he [Rennie] iis over in the next couple of months and we will nail things down. “It is almost as frustrating a position for a coach as for a player. You are just waiting for the pieces of the jigsaw to fall together. Dave will have his ideas and I will have to wait. “There are things I would like to do and will push for but I will be asked what my opinion is at some point. “My contract is up at the end of the season, so the discussions all go on around that. I have loved my time here at Glasgow I have been really fortunate to come into a coaching team like Glasgow have got.